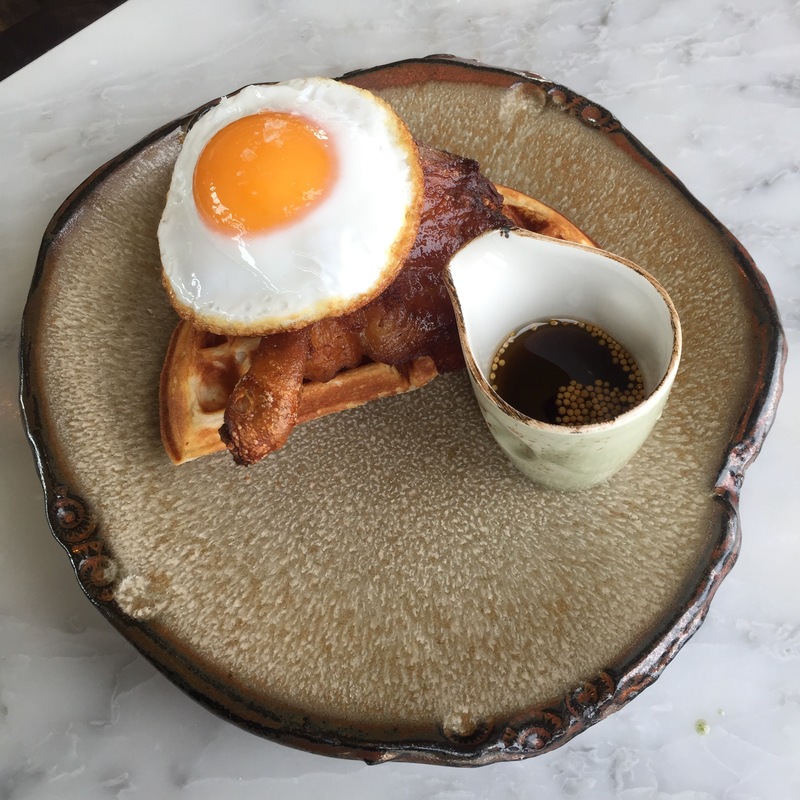 A few weeks ago, I was treated to lunch at Duck & Waffle. The friend I was with had never been to the Herron Tower (or whatever it goes by these day) so as you can imagine, the trip up the lift was filled with cheap thrills whilst the baby in her tummy bounced around! We arrived and had to wait 5 minutes for our table which was being cleared. When we were seated, we had a lovely table by the window overlooking East London. We had a look at the menu and as would be expected when two foodies go for lunch, our eyes were bigger than our stomach. We pinpointed the dishes we wanted to try, then set about ordering. First to arrive was the Crispy Polenta which was served with Parmesan & Truffle. On a side note, I hate the way restaurants simply list the ingredients giving you absolutely no inclination as to what will arrive. 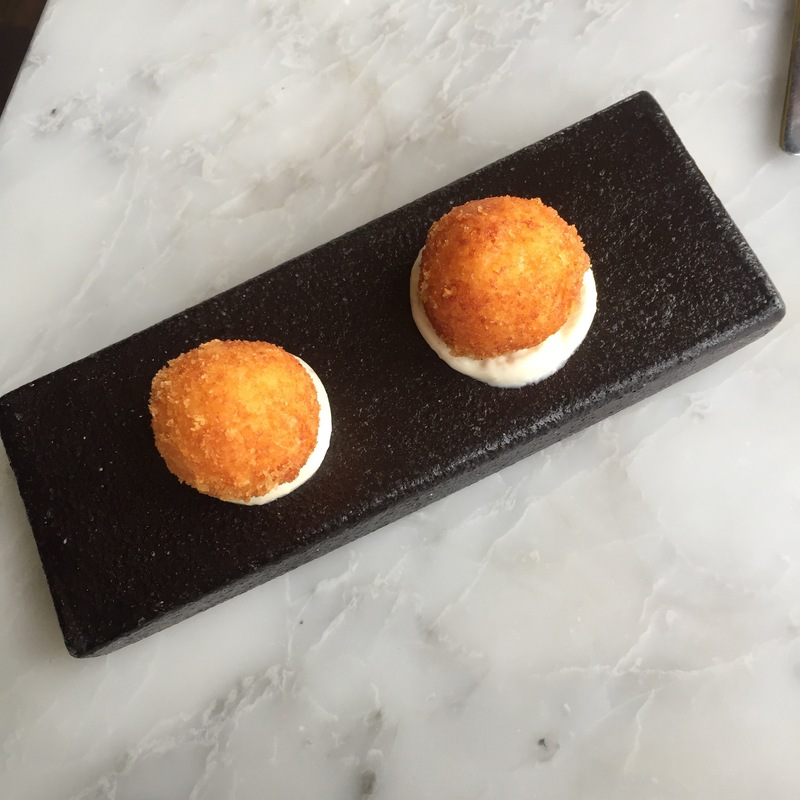 What did arrive were deep-fried, bread crumbed polenta balls, placed on top of parmesan & truffle (I guess) mayo/sauce. These were actually delicious. Having never tried polenta deep-fried, the texture was slightly grainy and slightly unrecognisable but so so good. Next, we decided to try one of the Freshly Baked Breads. Again the ingredients were simply listed, giving us absolutely no idea what we would receive. We went with the ‘Nduja & Gruyere. 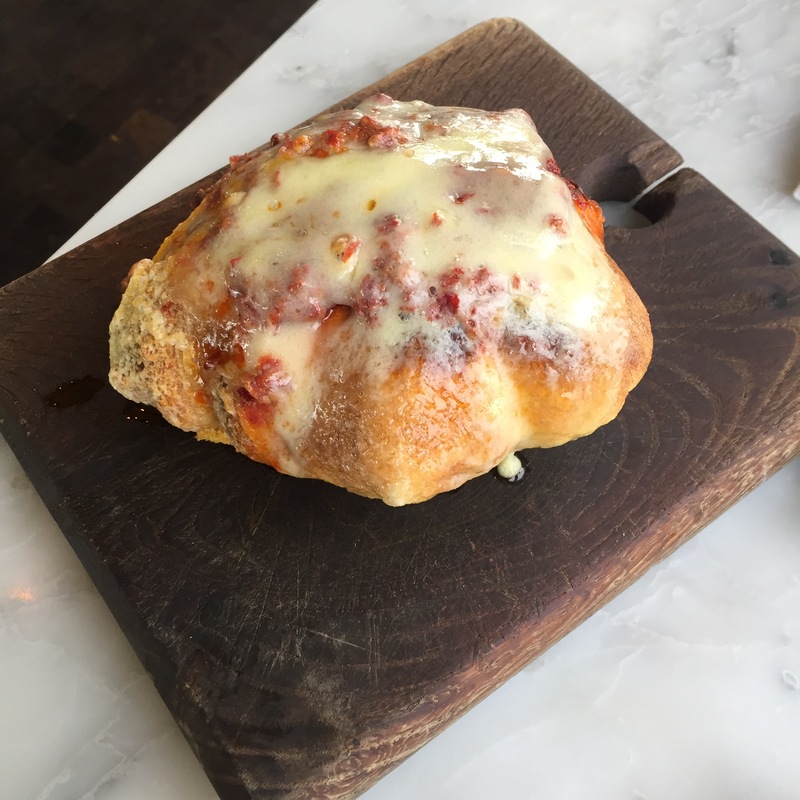 As you can see, what arrived was a slightly larger than normal bread roll, topped with ‘Nudja and Gruyère. The actual roll was quite hard and a beat of a feat to get into. I wouldn’t really recommend the bread, go for an extra portion of the Polenta balls instead! Next up were the small plates. We decided to pick one each and then one for good luck (don’t judge, we were hungry!). 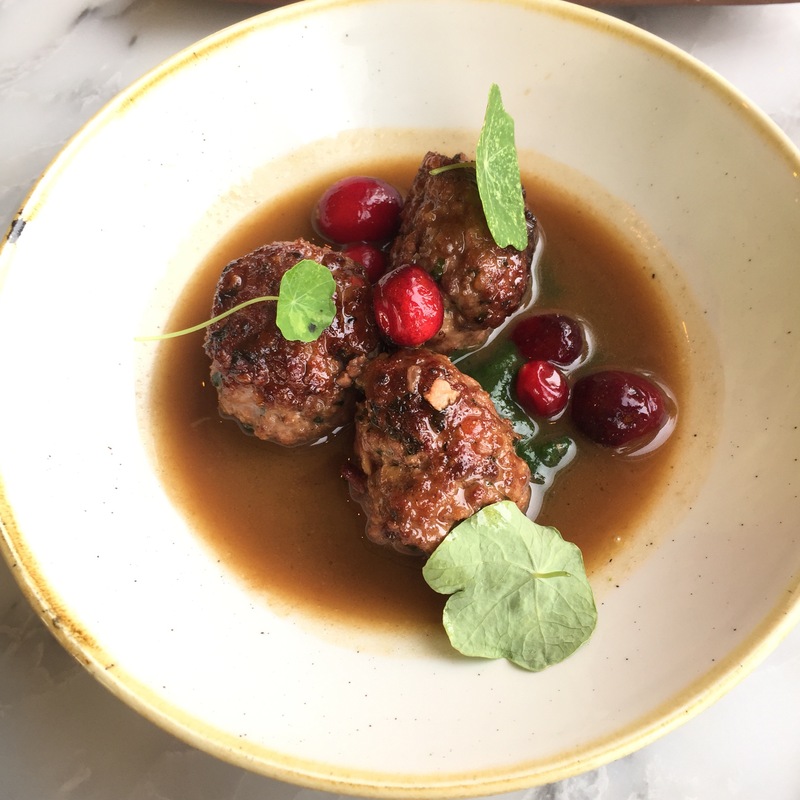 We started with the Goat Meatballs with anise, cranberries, thyme broth (!!!). These were surprisingly really very good, well seasoned, depth of flavour and a delicious broth. This is what meat balls should taste like! 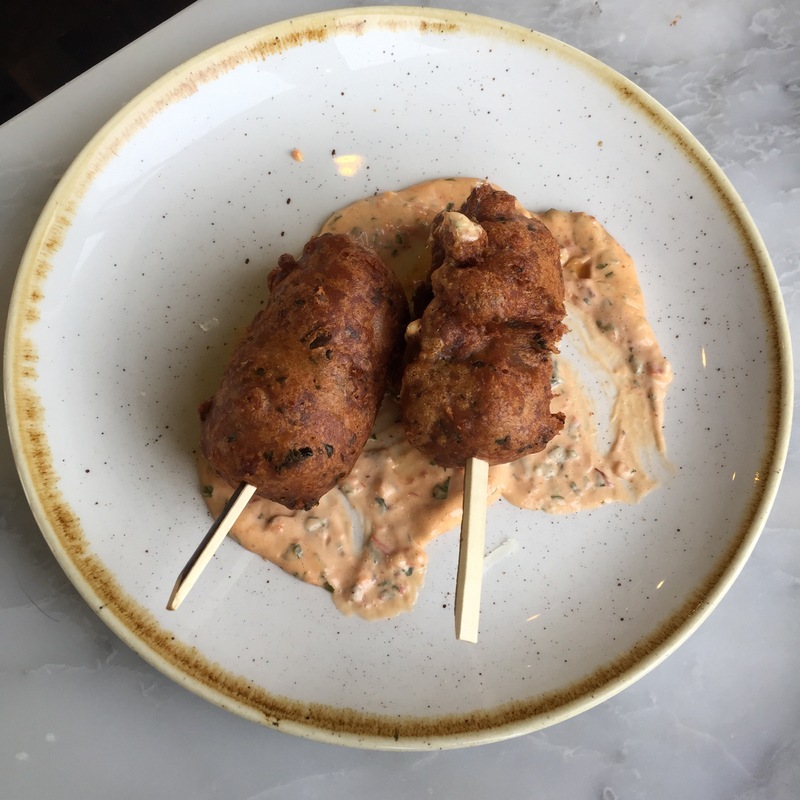 Next up was the Pork & Apple Corn Dog with chipotle mayonnaise. So I’ve never actually had a corndog, so didn’t know what to expect, but from the description (and lack of actual information), I assumed it would be a battered sausage on a stick. What arrived looked exactly how I expected it to, but tasted totally different. The battered outer layer was filled with pulled pork. It wasn’t nice, the pork was dry & stringy and it lacked flavour. I struggled to finish my portion. Last to arrive was the Yellowfin Tuna with watermelon, black olive, English mustard. 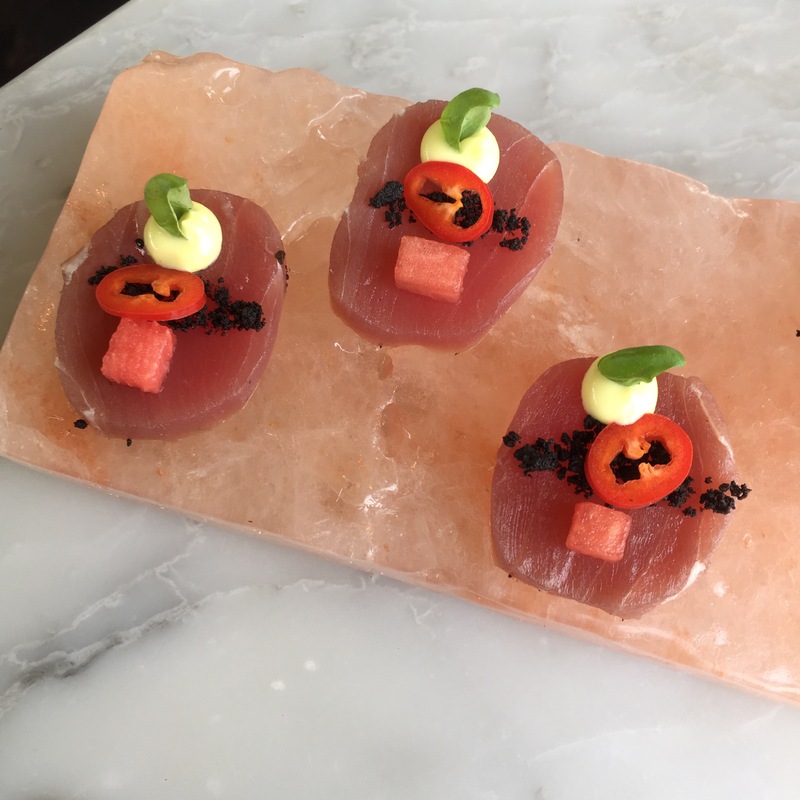 I usually really enjoy yellowfin tuna but for some reason, this tasted slightly over fishy, and became more fishy the longer it sat on the slab. Really sad given that yellowfin tuna is generally a sure bet. Finally we move onto mains – or main. Given that we were at Duck & Waffle, the only thing to try is the Duck & Waffle. All I can say is it really did live up to the hype. The duck was amazingly crispy, the egg was perfectly cooked with a runny yolk, the waffles were soft on the inside and crispy on the outside and the maple syrup was the perfect addition. We shared a portion, but honestly, any return trip will involve a whole plate of Duck & Waffle to myself! Duck and Waffle really is the kind of place you would want to go to with a group, even during lunch there was a buzz in the room, but moreover, with more people, you get to try more food and with such restaurants, you really do want to try as much as you can! This is definitely one that is worthy of a repeat visit!